We're having the biggest blowout of the year and you're invited! 4-20 is a number etched in cannabis culture. In case you're not familiar with 4-20, check out this blog post. We're celebrating 4-20 with our biggest sale of the year! 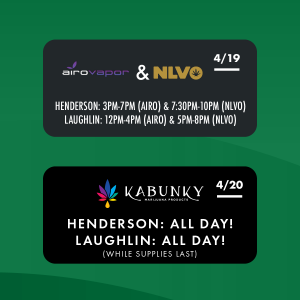 Not only will we have incredible deals going on April 20th, we'll have awesome vendor popups and specials the whole week leading up to the big event! These amazing events and specials are happening at both locations. 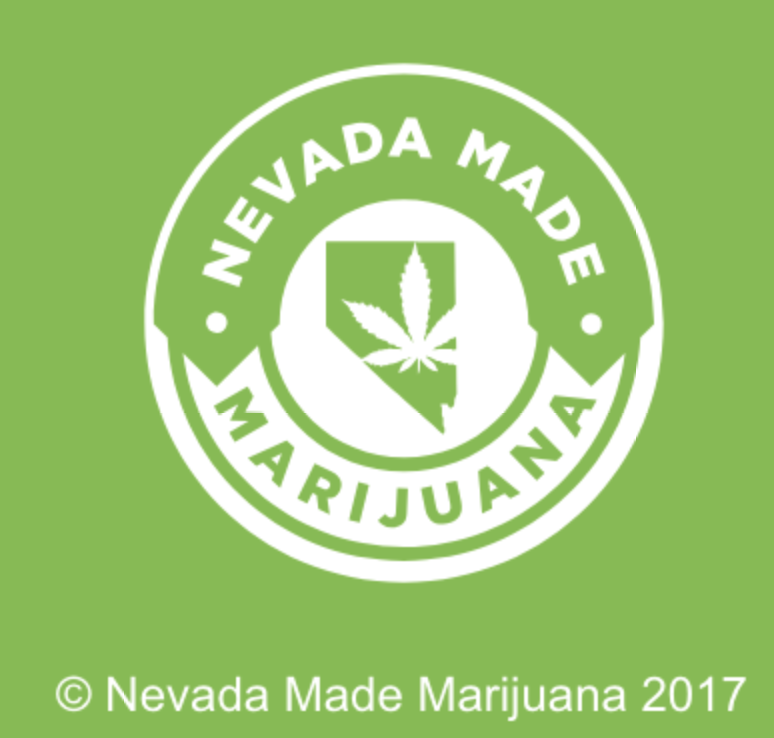 Whether you're in Laughlin or Las Vegas, you're going to love 4-20 at Nevada Made Marijuana! Monday the 15th save 20% on all VERT's delicious edibles! Tuesday the 16th save 20% on all CannaHemp and Denver Dab Co. products! 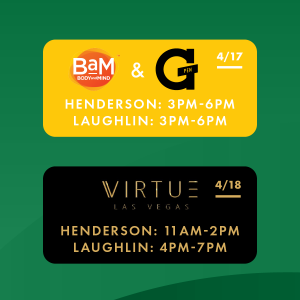 Wednesday the 17th save 20% on all BAM and G-Pen products! Thursday the 18th save 20% on all Virtue products! Friday the 19th save 20% on all AiroVapor and NLVO products! 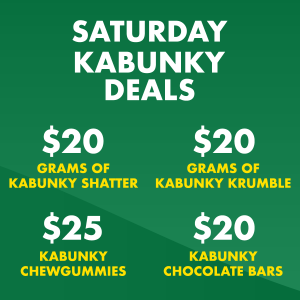 Saturday the 20th is our Kabunky blowout! 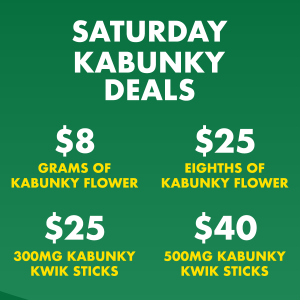 We're offering the best prices of the year on all Kabunky products. You've never seen savings this big! As you can see, everything's on sale. 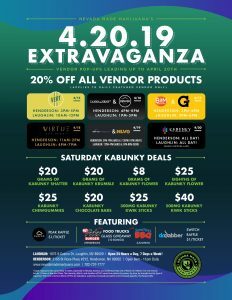 Whether you're a flower fan, you prefer edibles, you like vape cartridges, or you're a hard-core dabber, it's all deeply discounted for our 4-20 extravaganza! But that's not all! 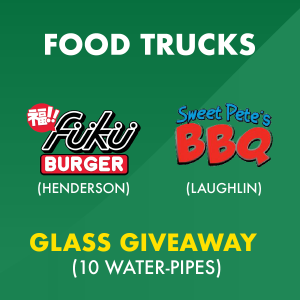 We're also featuring food trucks and raffles! In Henderson, enjoy the mouth-watering FUKU Burger. These are gourmet burgers with a Japanese twist! If you've never tried FUKU Burger, you're in for a treat! In Laughlin, tuck in to some Sweet Pete's BBQ! Their lip-smacking delights will satisfy your hunger and leave a smile on your face! Don't forget to pick up some raffle tickets. Each ticket is only $1 and you have the chance to win some pretty sweet gear. 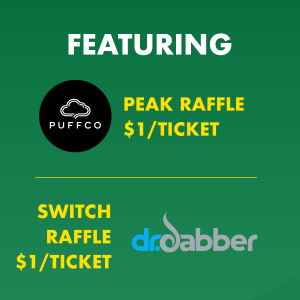 We're giving away 20 glass pieces, two Dr. Dabber Switch's, and two Puffco Peak's! The Puffco Peak is one of the most advanced dabbing devices on the market. It's easy to use, and gives you the perfect dab every single time. 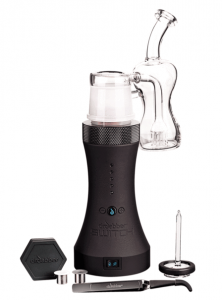 The Dr. Dabber Switch offers a modern, digital dabbing experience. You can set the perfect temperature for any type of concentrate. These prizes are worth more than $2,000 and you can win some for just a buck! 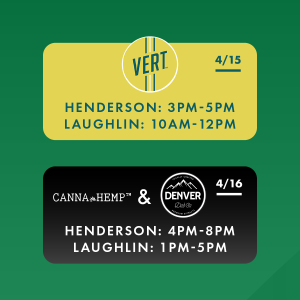 Come on down to either location to celebrate 4-20 all week long! It's going to be a great time and the savings can't be beat! But if you just can't wait, click here to order your favorite products right now!